The Singapore PlayStation Store has an advertisement for Mega Man 11 which contains a release date and a description of October 3rd with new information. Mega Man is back! The latest entry in this iconic series combines classic, challenging 2D platform action with a fresh look. The stunning new visual style refreshes the series's iconic colors, combining hand-drawn environments with detailed 3D character models. To save the day, the Blue Bomber has to fight Robot Masters and take his mighty weapons for himself, which now changes the look of the hero with new levels of detail. With the innovative new Double Gear system, you can increase the speed and power of Mega Man for a new twist on the satisfying gameplay the series is known for. A variety of difficulty modes make this a perfect opportunity to experience Mega Man for the first time! 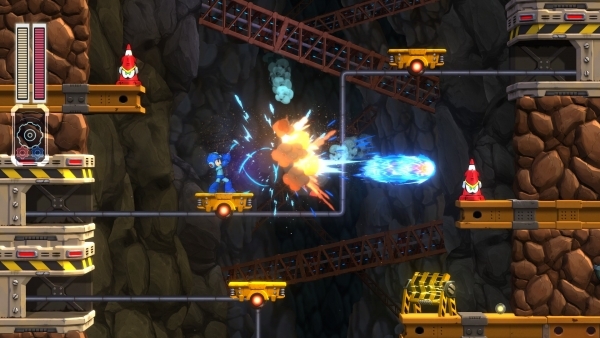 Capcom has not yet officially announced  a release date for Mega Man 11 . "It's being released for PlayStation 4, Xbox One, Switch and PC. Thank you, @ Wario64 .